› Author Affiliations Funding Funding was received solely from the National Institutes of Health, Department of Health and Human Service, Bethesda, MD, USA. Grant numbers: U01 NS041588, K08 HL096841 and R01 HL080477. This research project is supported by a cooperative agreement U01 NS041588 from the National Institute of Neurological Disorders and Stroke, National Institutes of Health, Department of Health and Human Service, Bethesda, MD, USA. The content is solely the responsibility of the authors and does not necessarily represent the official views of the National Institute of Neurological Disorders and Stroke or the National Institutes of Health. Representatives of the funding agency have been involved in the review of the manuscript but not directly involved in the collection, management, analysis or interpretation of the data. The authors thank the other investigators, the staff and the participants of the REGARDS study for their valuable contributions. A full list of participating REGARDS investigators and institutions can be found at http://www.regardsstudy.org. Additional funding was provided by an investigator-initiated grant-in-aid K08HL096841 and R01HL080477 from the National Heart, Lung, and Blood Institute, National Institutes of Health, Department of Health and Human Service, Bethesda, MD, USA. Representatives from the National Heart, Lung, and Blood Institute did not have any role in the design and conduct of the study, the collection, management, analysis and interpretation of the data, or the preparation of the manuscript. Background Haemostatic balance represented by low protein C (PC) and elevated factor VIII (FVIII) has been inconsistently associated with stroke and coronary heart disease (CHD) risk. Objective This article assesses whether an elevated FVIII and a low PC would increase cardiovascular risk more than either individually. Patients and Methods REGARDS recruited 30,239 black and white U.S. participants aged ≥ 45 years between 2003 and 2007. FVIII and PC were measured in a case–cohort sample of 646 stroke, 654 CHD, and a 1,104-person random sample with follow-up for approximately 4.5 years. Hazard ratios (HRs) were estimated using Cox models adjusted for demographic and cardiovascular risk factors. Results Elevated FVIII (per standard deviation [SD] increase) was associated with increased risk of both stroke (HR, 1.26; 95% confidence interval [CI], 1.08, 1.46) and CHD (HR, 1.52; 95% CI, 1.29, 1.79), while there was no association of PC per SD decrease. For PC, there was a trend towards increased cardiovascular disease risk in the lowest values (bottom 5%). 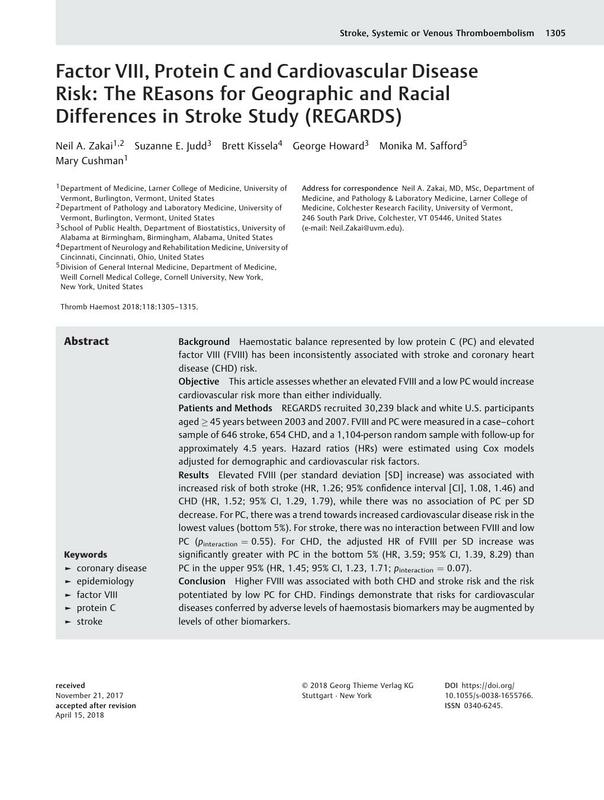 For stroke, there was no interaction between FVIII and low PC (p interaction = 0.55). For CHD, the adjusted HR of FVIII per SD increase was significantly greater with PC in the bottom 5% (HR, 3.59; 95% CI, 1.39, 8.29) than PC in the upper 95% (HR, 1.45; 95% CI, 1.23, 1.71; p interaction = 0.07). Conclusion Higher FVIII was associated with both CHD and stroke risk and the risk potentiated by low PC for CHD. Findings demonstrate that risks for cardiovascular diseases conferred by adverse levels of haemostasis biomarkers may be augmented by levels of other biomarkers. Obtained funding: N.A. Zakai, M.M. Safford and G. Howard. Research design and methods: All authors. Statistical analyses: N.A. Zakai and S.E. Judd. Initial manuscript draft: N.A. Zakai. Critical revision and scientific review of the manuscript: All authors.